Small size (30.2mm x 22.7mm) 18K pink gold case set with brilliant-cut diamonds, nine-sided crown set with a brilliant-cut diamond, sapphire crystal, slivered and lacquered flinqué dial with Roman numerals and sword-shaped blued-steel hands, quartz caliber Cartier 057 movement, 18K pink gold bracelet set with brilliant-cut diamonds. Water resistant to 30 meters. Medium size (39.2mm x 29.8mm) 18K pink gold case set with brilliant-cut diamonds, nine-sided crown set with a brilliant-cut diamond, sapphire crystal, diamond paved 18K pink gold dial, self-winding caliber Cartier 076 movement, 18K pink gold bracelet set with brilliant-cut diamonds. Water resistant to 30 meters. 34.7mm 18K pink gold case set with brilliant-cut diamonds, 7.1mm thick, crown set with a diamond, 18K pink gold bezel set with brilliant-cut diamonds, silver dial, quartz movement with sword-shaped hands, 18K pink gold bracelet set with brilliant-cut diamonds. Water resistant to 3 bar. 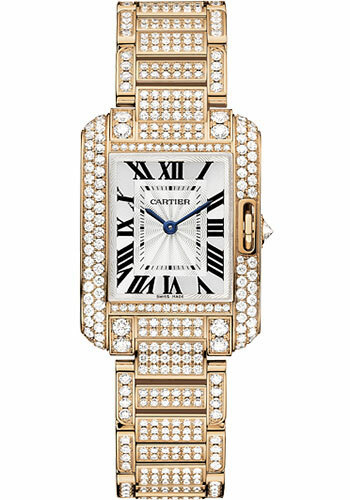 30.2mm x 22.7mm 18K pink gold case set with 11 brilliant-cut diamonds, 7.19mm thick, sapphire back, 9-sided crown set with a brilliant-cut diamond, 18K pink gold bezel set with a brilliant-cut diamonds, sapphire crystal, silver dial set with brilliant-cut diamonds, quartz movement with sword-shaped hands in blued steel, 18K pink gold bracelet. Water resistant to 30 metres. 39.2mm x 29.8mm 18K pink gold case set with 11 brilliant-cut diamonds, 9.5mm thick, sapphire back, 9-sided crown set with a brilliant-cut diamond, 18K pink gold bezel set with a brilliant-cut diamonds, sapphire crystal, silver dial set with brilliant-cut diamonds, self-winding movement with sword-shaped hands in blued steel, 18K pink gold bracelet. Water resistant to 30 metres. Small size (30.2mm x 22.7mm) 18K pink gold case set with brilliant-cut diamonds, nine-sided crown set with a brilliant-cut diamond, sapphire crystal, slivered and lacquered flinqué dial with Roman numerals and sword-shaped blued-steel hands, quartz caliber Cartier 057 movement, 18K pink gold bracelet. Water resistant to 30 meters. Medium size (39.2mm x 29.8mm) 18K pink gold case set with brilliant-cut diamonds, nine-sided crown set with a brilliant-cut diamond, sapphire crystal, slivered and lacquered flinqué dial with Roman numerals and sword-shaped blued-steel hands, self-winding caliber Cartier 077 movement, 18K pink gold bracelet. Water resistant to 30 meters. Large size (47mm x 36.2mm) 18K pink gold case set with brilliant-cut diamonds, transparent sapphire crystal back, nine-sided crown set with a brilliant-cut diamond, sapphire crystal, slivered and lacquered flinqué dial with Roman numerals and sword-shaped blued-steel hands, self-winding caliber Cartier 1904MC movement, 18K pink gold bracelet. Water resistant to 30 meters. Medium size (39.2mm x 29.8mm) 18K pink gold case set with brilliant-cut diamonds, nine-sided crown set with a brilliant-cut diamond, sapphire crystal, diamond paved 18K pink gold dial, self-winding caliber Cartier 076 movement, 18K pink gold bracelet. Water resistant to 30 meters. 34.7mm x 26.2mm 18K pink gold case set with brilliant-cut diamonds, 7.1mm thick, sapphire back, 9-sided crown set with a brilliant-cut diamond, 18K pink gold bezel set with a brilliant-cut diamonds, sapphire crystal, silver dial set with brilliant-cut diamonds, quartz movement with blued-steel sword-shaped hands, 18K pink gold bracelet. Water resistant to 3 bar.